An astronaut takes a hot bath on the Skylab space station in 1973. 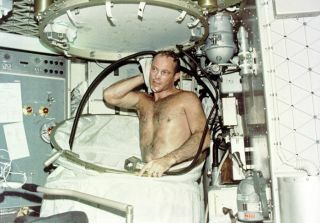 In this historical photo from the U.S. space agency, a close up view of astronaut Jack R. Lousma, Skylab 3 pilot taking a hot bath in the crew quarters of the Orbital Workshop (OWS) of the Skylab space station cluster in Earth Orbit. This picture was taken with a hand-held 35mm Nikon camera. Astronaut Lousma, Alan Bean and Owen K. Garriott remained within the Skylab space station in orbit for 59 days conducting numerous medical, scientific and technological expierments. In deploying the shower facility the shower curtain is pulled up from the floor and attached to the ceiling. The water comes through a push-button shower head attached to a flexible hose. Water is drawn off by a vacuum system.